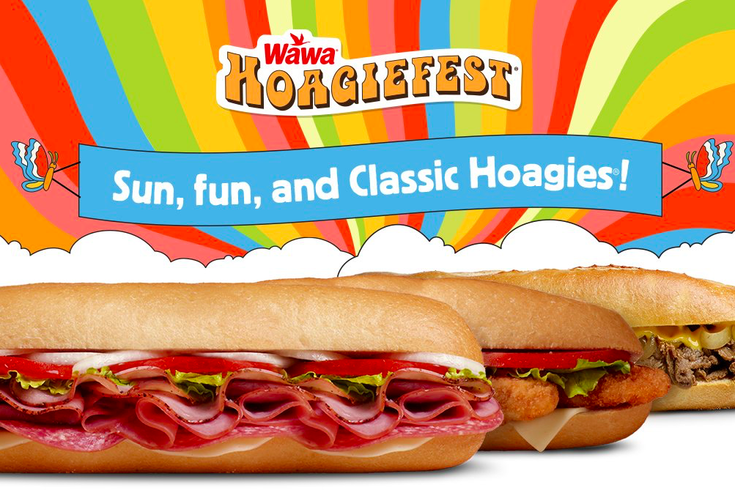 Wawa Hoagiefest 2016 begins on Monday, June 20. Wawa's Hoagiefest has returned for another sweltering Philadelphia summer, and with it comes the sweet music of Parry Gripp and his 60s-inspired hoagie tunes. This year's new jingle, "Fun All Summer," is a mediocre submission into the Hoagiefest soundtrack. That's not a slight on Gripp; in fact, it speaks to the standard he's set. Gripp's voice still has that unmistakable joy in it, and it's in the British Invasion style of pop that Delaware Valley residents have come to know and love. But it's a bit bland compared to his work from years past. With that in mind, let's take a look at the top five Hoagiefest jingles since Gripp started making them in 2009 after Wawa's marketing team discovered his viral "Do You Like Waffles?" music video. To make things simple, I'll be judging them off of two basic standards. First, how much does it sound like a regular pop hit compared to an advertisement? In other words, are the Hoagiefest references subtle enough that could I believe it's just a song, and not a commercial, if I heard it on the radio? Second, how catchy is it? Am I humming it all day after stopping in for a morning coffee? #5 — "Life is Sweet"
Woah, did I just eat a hoagie or awake from a psychedelic dream? One of Gripp's more experimental jingle's, akin to George Harrison's dive into Indian classical style music in "Within You Without You." Trippy, man. Pass me a Shorti. #4 — "Great Day For A Hoagiefest"
You can almost imagine the boys from Liverpool marching their way down a flight of stairs to this one, holding a meatball hoagie in one hand and a sweet iced tea in the other. #3 — "Hoagie In The Sky"
Of the two HoagieMan ballads, "Hoagie In The Sky" is the more musically complex — that bridge with the high-pitched "Everybody now!" is just great. Besides, "Here Comes The HoagieMan" makes HoagieMan sort of sound like the ultra-creepy Nightman from the mind of Charlie Kelly in "It's Always Sunny in Philadelphia." The second time Gripp belts, "Oh Hoagiefest," there's a real sense of longing in his voice. This one drips with a nostalgic coating that makes Hoagiefest feel more like an ex-lover or a period in time when things were simpler and hoagies cost just a nickel. #1 — "Are You Ready For Hoagiefest Again"
Irresistibly catchy, the mentions of Wawa and hoagies are so masterfully snuck into the lyrics you hardly realize your being told to go buy a sandwich. Not only am I ready for summer and Hoagiefest, but I'm prepared to dance-walk into the nearest Wawa and hug every person I meet. You can download all of the Hoagiefest tunes here, and if you disagree with the rankings, feel free to let us know in the comments below.